Salaried vs. Hourly Employees - What is the Difference? What is the Difference Between Salaried and Hourly Employees? Employees are categorized both on the type of work they do and the ways in which they get paid. In some cases, employees are also categorized based on whether they receive an employment contract. The terms "salaried" and "hourly" refer to how employees get paid. If you don't know how to pay employees correctly, you can run into problems with employees who don't receive the pay they expect and with your state and federal employment laws. In this article, we'll look at what makes an employee salaried or hourly and how to pay these employees correctly. We will also look at the terms "exempt" and "non-exempt" as they refer to salaried and hourly employees. What Determines if an Employee is Salaried or Hourly? The distinction between salaried and hourly employees is based on the type of work done by these employees and their status as exempt or not exempt from overtime. If an hourly employee works more than 40 hours a week, he or she may be eligible for overtime pay (federal law). State laws also regulate when overtime may be paid and the rate of pay. An employer is always allowed to pay overtime more generously to hourly employees than required by law. Federal wage and hour laws expect that all employees will receive overtime, but some employees are considered to be exempt from overtime. Professional employees, managers, and supervisors (salaried employees) are considered as exempt from overtime. Who Do I Hire First - Salaried or Hourly? Let's say you are starting a business and you wonder if you should hire salaried vs hourly employees. The question you need to ask is if you want to hire professionals, and managerial employees first, or if you want workers. In most cases, you will want to hire managers first, so they can help you set up the business the right way. These people will most likely be salaried because they will be the type of employees who are classified as exempt from overtime. If your business is going to stay small and you plan to hire mostly hourly employees, plan on doing the supervising yourself. A salaried employee is paid based on an annual amount, called a salary. This salary is divided between the pay periods (as determined by the company) for the year and based on a 2080-hour year. Some salaried employees are given an employment contract. They get paid not for hours worked but on that overall salary, so if a salaried employee works more or less than a "normal" 40-hour work week, that is not documented by the employer. An hourly employee is paid based on an hourly amount. Hourly employees don't have a contract and are only paid for hours worked. The employer determines the hours for an hourly employee each week. Hourly employees must document their work by using a time card system or completing a time sheet, which the employer verifies. There is no requirement that an hourly employee must be given a specific number of hours of work a week. Employees who work less than full-time are considered part-time, and they may have different pay rates, benefits, and paid time off than full-time hourly employees. 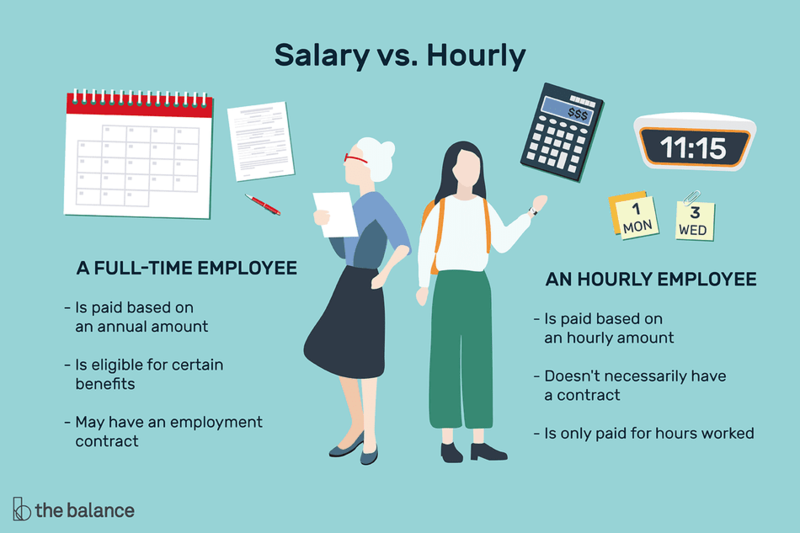 Since salaried employees are paid annually, and hourly employees are paid by the hour, their pay calculations are very different. Example: A salaried employee is paid $20,000 a year. This salary is divided by the number of pay periods in the year to determine the salary for each pay period. If salaried employees are paid monthly, this employee would receive $1666.67 a month. Example: An hourly employee is paid $9.62 an hour. To find this employee's payment amount, the hourly rate is multiplied by the number of hours worked in a pay period. For calculation purposes, a salaried employee is determined to work 2080 hours a year (52 weeks times 40 hours a week). So, in the examples above, the $9.62 an hour paid to the hourly worker is roughly the same as the $20,000 annual salary paid to the salaried worker. Salaried employees may also be eligible for overtime if their average weekly pay is less than the minimum set by the Department of Labor. If the salaried employee's pay is under the minimum, they must be paid 1 1/2 times their hourly calculated rate, for any hours worked over 40 in a week. For more information on the exact minimum pay level, see this article on overtime pay and check this additional article on the regulations governing overtime pay for exempt and non-exempt employees. New overtime regulations for salaried exempt employees have been proposed by the Department of Labor, but the implementation has been put on hold pending litigation. A salaried employee receives a salary and an hourly employee receives pay based on an hourly rate. The way an employee is paid has some relationship to exempt vs. non-exempt status. Hourly employees are almost never exempt. Salaried employees may be exempt from overtime if they meet the tests of being in a specific type of "white collar exemption" job and being above the minimum salary, as described above. Read more about what qualifies an employee as exempt. But not all exempt employees are salaried. Some exempt employees may receive a fee for a unique job. This type of payment is most common in computer and technical professions. So, a salaried employee is almost always categorized as exempt, but a non-exempt employee may or may not be salaried. Your company is required to pay employees the correct amount of money for each pay. Both federal and state laws set these requirements, including, for example, minimum wage rates. In another example, if you pay an employee a salary when this employee should be paid an hourly rate, you may not be paying overtime as required by federal and state regulations. The consequence of not paying employees the correct amount as required by law may result in lawsuits by employees or having to pay fines and penalties for underpayment. Check with your employment attorney to make sure you are paying employees correctly as salaried or hourly and that you are paying overtime correctly. Make sure you pay them overtime at least at a minimum over 40 hours in a week.